Support our Advertisers…Support the Show. Thank you. It’s so lovely to have you here! Election season is upon us again, rearing its ugly head, and America is more polarized today than ever before! Whether the issue is Donald Trump, healthcare, abortion or gun control, it can be hard to voice an opinion without ruffling someone’s feathers. This week The Halli Casser-Jayne Show offers up one contentious interview highlighting the great divide and one interview with a man who through experience has learned how to talk across the great divide. Joining Halli at her table is Dr. Richard Kradin, right-wing zealot and author of OUT OF CONTROL: APOCALYPTIC PSYCHOLOGY IN THE AGE OF TRUMP and Justin Lee, author of TALKING ACROSS THE DIVIDE. The podcast is posted at Halli Casser-Jayne dot com and on all your favorite apps, including Google Podcasts, Apple Podcasts, Stitcher, and more. Richard Kradin, M.D. 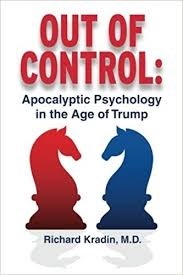 is a Harvard professor, senior physician at the Massachusetts General Hospital, a trained psychoanalyst and the author of a controversial new book OUT OF CONTROL: APOCALYPTIC PSYCHOLOGY IN THE AGE OF TRUMP, and controversial is an understatement. In OUT OF CONTROL, Dr. Kradin attempts to explains the psychological roots of political divisiveness that threatens to rend the fabric of American society. In the opening of his book Dr. Kradin states “All human behavior is ultimately driven by psychology. My goal is to explain the present conflict from a psychological perspective.” Good so far. And then Kradin goes on to say that change is occurring rapidly on the political left, asserting that there has been a progressive breakdown of traditional moral values, concurrent with the emergence of feminism, identity politics, and peer-pressure mediated via social media. These changes have increased existential societal stress producing a perfect neurotic storm on the left that aims to cleanse society of any traces of chaos, strong emotion, or natural human bias, via a strategy of “political correctness” that threatens American freedom of expression. You won’t want to miss Halli going nose to nose with Dr. Kradin, talking across the divide. Is communication a lost art? 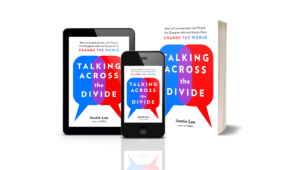 In TALKING ACROSS THE GREAT DIVIDE, HOW TO COMMUNICATE WITH PEOPLE YOU DISAGREE WITH AND MAYBE EVEN CHANGE THE WORLD, social activist Justin Lee known for building bridges between conservatives and progressives on matters of faith and public policy, centers on how you can get through to people who think differently from you, one productive conversation at a time. At the heart of the book are Lee’s tried and true strategies to help readers break down the five most common barriers (and yes, fake news is one of them) that prevent their target audience from being able to hear—let alone accept— differing opinions. In a world where people too often retreat to their self-affirming echo chambers when their beliefs are challenged, this focus on productive dialogue and mutual understanding is more important than ever. Because echo chambers don’t just nurture conformity; they can also nurture extremism. Talking across the divide, communication, elections, Trump, Liberals vs. Conservative, social media, progressives, Republicans, Democrats, politics…The Halli Casser-Jayne Show has it all, the podcast posted at Halli Casser-Jayne and available via all your favorite apps.